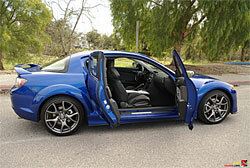 Mazda has received much praise for their RX line of cars, with the 2003 RX-8 replacing the popular RX-7. As the only major car manufacturer to use a rotary engine, I was interested to see how it performed. Rotary engines inherently offer a compact, comparably lightweight engine, operating at higher RPM that standard piston engines. Did it deliver the same excitement as a V-6 with similar horsepower? Did it deliver zoom-zoom? I tested the new R3 package that is available on the RX-8 for the first time on the 2009 model. The package provides a significant improvement to the suspension as well as sports tires, but also includes a variety of non-driving improvements, not the least of which is a 300 Watt Bose sound system that includes noise-canceling technology. As I put this car through its paces, I felt a bit like Speed Racer driving the Mach 5. Both cars had advanced engines and were loaded with lots of cool gadgetry from Japan. The RX-8 delivers a unique driving experience due to its engine technology that allows the car absolute balance in forward-rear weight distribution. The smaller rotary engine can be placed behind the front axle. Combined with its lighter weight, this placement results in a very maneuverable car that hugs the road. With the six-speed manual transmission in my hand, I caught myself driving like I was trying to beat Racer X. The build of the RX-8 emerged as one of the weaker elements of the car. While I like the shorter front doors and easy access that the rear suicide doors offer, I found that I sometimes had to repeatedly close the front doors to get a secure fit. I’m not sure if this was poor design or assembly, but it did not offer the reassuring thunk of a solidly built and securely closed door. Also, there was a rattle on the dashboard plastic that occasionally expressed itself around 40 mph. A minor issue, but a major irritant for an owner of a brand new car (our test vehicle already had 6,700 miles rolled up by previous journalists). The vast majority of my RX-8 experience did suggest intelligent design and proper assembly, but I found this car behind the competition in build quality. Like most sports cars, the RX-8 does not offer lots of space in the cabin. However, the instrumentation and controls are for the most part thoughtfully laid out for easy access.The RX-8 dashboard focuses the driver’s attention on the engine by putting the tachometer dead center with the largest indicator. By comparison, speed is indicated with a digital readout that is almost lost within the tachometer face. The center console extends clear to the back seat, but it offers little storage. It does have some nice cup holders for the rear passengers, but I don’t see the back seats being used for any lengthy trips. While I was able to squeeze my six foot frame into the back seat, I’m glad the car was stationary or my head would have taken a beating from the sport suspension. The front Recaro seats, on the other hand, are quite comfortable and deep, holding you in place for any high-g turns. Getting into or out of them presents a challenge, but what performance cockpit is built for comfortable ingress/egress? The stereo was the best I’ve heard in a movable platform – absolutely crisp with plenty of power. A great choice by Mazda. The rotary engine offers a significantly different torque curve than the tradition piston engine, with the power band at much higher RPM. Regular performance generally saw the engine above 3,000 RPM, while more robust driving frequently took the engine up to 6,000 RPM, which was still far below redline. A side effect of this higher revving engine was lower observed fuel mileage. With 232 horses, the RX-8 delivers the ‘get-up-and-go’, especially when joined to the 6-speed manual transmission. Working through the gears made me feel like Speed Racer working around the track – plenty fast and lots of fun. The handling is ultimately what will make you buy this car and smile every time you drive it. As mentioned earlier, with the smaller engine placed behind the front axle and the 50-50 weight distribution, the RX-8 handles turns with surprising agility. It pops around corners in complete control, waiting for the next one. It never felt nose heavy or even slightly fish-tailed as the car nimbly danced around every bend in the road. It is simply a joy to drive. A strong point for the RX-8, the styling impressed onlookers to the point that they would stop me to ask questions. The muscular hood and wide grill complement the spoiler in the rear and clearly identify this as a sports car. The R3 package does include several design features to increase the aggressiveness, and they are appropriate for the driving this car expects. The swooping wheel fenders and flowing lines reminded me of the graceful lines of Speed Racer’s Mach 5. Both cars were built to race and to look good doing it. It can got to 9200 rpm then you get redline. It sounds like a turbine jet engine inside the cockpit of this rotary machine. It is absolutely fun to drive and is a handling monster with the 50/50 weight distribution. I think it needs a supercharger to make it perfect. Those have got to be the finest stock wheels on a car ever! I got to drive this car and you have to keep the revs higher than 4000 rpm. But it goes all the way 8k so there’s lots of room for fun. The cornering is incredible the car sits on corners at the limit. I would have loved to break out the rear and do some drifting but I guess I’ll just have to watch Top Gear for that.